This NASA SR-71 completes its first flight at Dryden Flight Research Center in October of 1997. In this historical photo from the U.S. space agency, a NASA SR-71 successfully completed its first flight October 31, 1997 as part of the NASA/Rocketdyne/Lockheed Martin Linear Aerospike SR-71 Experiment (LASRE) at NASA's Dryden Flight Research Center, Edwards, California. The SR-71 took off at 8:31 a.m. PST. 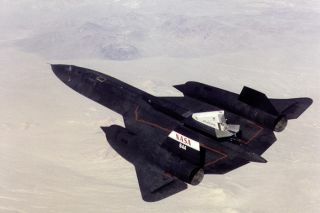 The aircraft flew for one hour and fifty minutes, reaching a maximum speed of Mach 1.2 before landing at Edwards at 10:21 a.m. PST, successfully validating the SR-71/linear aerospike experiment configuration.